In the mid-80s, specifically, after the February 1986 EDSA People Power Incident and the change in Political Leadership, the conduct of Running Events had diminished but some of the international/multi-national companies in the country continued their yearly events as Race Organizers, maybe, it’s because it is one of their “tax shelters” or tax-deductible items and not so-much as an income generating activity for the company. It could had been a part of their so-called “Corporate Social Responsibility” by giving back something to the public as their main stakeholder. As for the government, there was no initiative to conduct such running events and the elite program in sports was ignored and shelved without any attempt of resurrecting it up to this time. In the advent of the Internet and its accessibility to the country, the Social Media, through WordPress and Blogger, anybody who owns a laptop or computer with connection with the Internet, can already write anything under the sun and have it posted so that others could read them. In the country, Bull Runner started a running blog and I followed (after 5 months) to create my own and the Bald Runner was born and the rest is history. The year was in 2007. 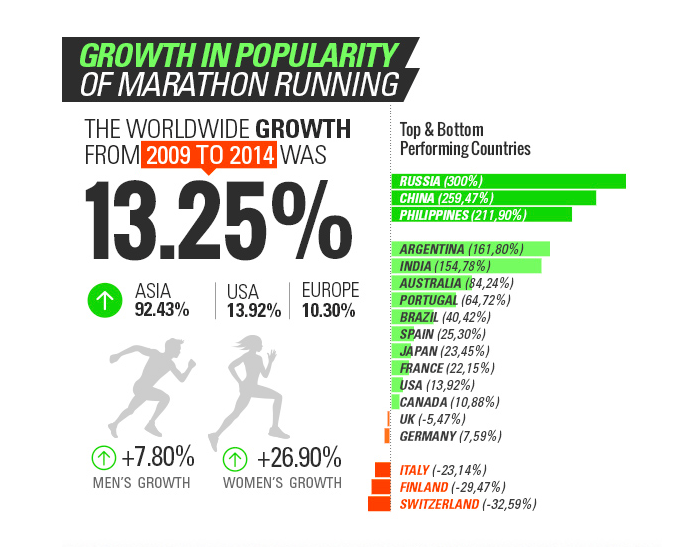 It appears that we are in the Top Podium, being the Number 3 in the Top Performing Countries with regards to the Growth In The Popularity of Marathon Running during the period of the study. We have a 211.90% growth in the Philippines which is HUGE! And as such, we also contributed as the Top Continent in the World (ASIA) with a 92.43% growth which is also huge! I can only surmise that Bull Runner and I were the “catalyst” of this phenomenon in the country as other bloggers/runners followed to create their own blogs whether they are there as “real and dedicated” runners or simply as running resource for running events or fond of “reposting” articles or links in the Internet related to Running. In the data below, China beats us for the 2nd place by mere 47+% but as compared to our population with theirs, our growth in running is REALLY HUGE!!! Other countries in Asia are also significantly growing in marathon running, Hongkong is #7 followed by India with Singapore as #10. Based from the data above, I would conclude that we are in our “2nd Running Boom” era. I could see that this is a good sign of things that had been happening since 2009 and for sure, more positive to come in the future. Why? Because the data portrayed had been good to the economy of the country! (Find somebody who is graduate of AIM or any Business Degree for the explanation!) There could be some exceptions to this case but I am very positive that this growth in marathon running had and will have a direct contribution to the economy of our country in the future. In short, I am happy that I am one of those who are contributing to a positive outlook in the economy of this country due to running. I wonder what would be the data and analysis if a study or research would be made for ultra marathon events, as well as, trail running events in the country would be like ever since I started with the Bataan Death March 102 Ultra Marathon Races and other PAU Races. I am sure, this will be an interesting one. But that will be another story in this blog! Movie Review: "On The Job"